A mixed day of sunshine and clouds today. In the early morning we were fortunate to avoid two passing squalls. Towards mid-morning the skies cleared and the breeze diminished, but fairer winds came in late afternoon. The crew conducted a man-overboard drill today. Frankly, it was not our best effort as it took over half an hour to find our orange life-ring “victim.” But we learned some important things from today’s exercise and have now put in place new procedures–such as keeping the engine always on the dinghy–that would reduce our response time in an emergency. A sharp-eyed Jack Pitman from Reston, Virginia (USA) asked about some carving on the Jewel of Muscat’s steering beam that he had not noticed in earlier photographs from the voyage. 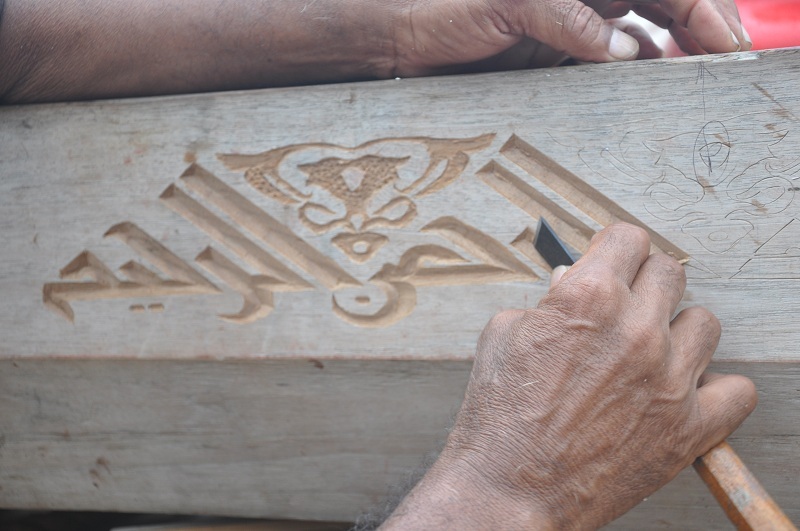 The inscription is indeed new–having been carved by Mohamed Ismail (Tuanie) during the ship’s extended stay in Galle. It consists of a short passage from the Holy Koran: “In the name of Allah, the Almighty and All-merciful.” The script is Eastern Kufic–one of three main forms of Kufic writing which originated in the city of Kufa, Iraq between the 8th and 10th centuries CE. At that time Kufa was an important commercial and literary centre and its highly talented scribes succeeded in developing a beautiful, distinctive, and enduring style of writing which is still popular for decorative purposes. Indeed, an important example of Eastern Kufic stript can be seen on an inscription discovered in Galle which dates from 1411 CE. Given this connection with Galle, and the fact that Eastern Kufic was a dominant Arabic and Persian script in this region during the 9th century, it seemed appropriate to use this style for the Jewel of Muscat inscription. At the moment (0400), we are 90 miles west of the Nicobar Islands. The winds are light and the sea is calm. The Jewel creaks lightly in time with gentle swells, its sails and rigging silhouetted against a brilliant half-moon.